Buying children's shoes can be a difficult task. Toddlers are unable to really tell you if a shoe fits comfortably and most teenagers are more concerned with stylish then they are with the actual fit of a shoe. There are some tips to ensure a comfortable, proper fitting shoe for your children this back to school shopping season. 1. Measure in the Afternoon- Your feet expand throughout the day so shopping for shoes in the afternoon will give you the most accurate fit. You want to make sure your child's shoes will fit in throughout the day. Also, you should always have your child measured when you are shoe shopping. 2. Check the Quality of the Shoe- The best quality shoes are stiff in the heel. You shouldn't be able to pinch your fingers together when pinching the heel. Also, the shoe should not be bendable. You want a sturdy, supportive shoe. Lastly, you should not be able to twist the shoe. 3. Check the Material- The material should be breathable, like mesh, leather or cloth. You want your child's feet to be able to breathe throughout the day to prevent odor and bacteria from forming. 4. 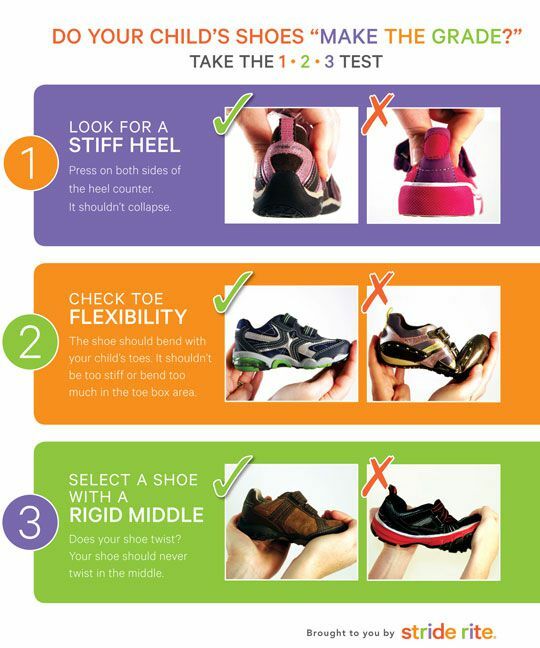 Get an Extra Pair- Your child should have a pair or a few shoes to rotate wearing. Your shoes need about 24 hours to dry out from the sweat so having another pair to wear while the other pair gets a break is the best case scenario. If your child is walking "funny", retracts from sports or their normal activities, this could be a sign of a foot problem and your child should be seen by a podiatrist.